All of us want what we want all the time, especially in our relationships. So what do you do when your partner doesn’t play along with what you want? What do you do when you or your partner fall into temporarily relationship insanity? 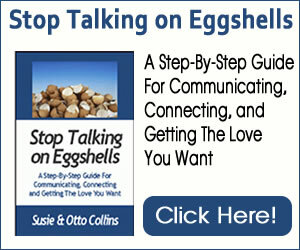 The men and women we’ve been talking with lately are trying to prevent their relationships from permanently imploding when they or their partner gets triggered big time. They know they are “overthinking” and “taking it personally” but somehow, they can’t stop their thinking that it IS personal. And usually the age-old pattern appears of one person withdrawing and the other person wanting to “talk about it,” “Get some answers” or “Resolve it)–and neither person ever really gets what he or she wants. 1. Patterns show up so that you can become aware of what’s automatically running your life. As we talked, one woman discovered that she had been coming on very strong and maybe “demanding” like her father which could be part of the reason her partner pulls away from her. She saw how her actions could be construed as being “pushy” even though that wasn’t her intention. When you slow down your pattern, stand back without blaming or judging you or your partner and just look at it, you’ll begin to see how it is that you get caught up in your never-ending relationship drama. You’ll also get glimpses of how you can at least stop your part in it by choosing something different. 2. When you “see” it, know that you don’t have to believe the thoughts that are creating the feelings that are creating the behaviors you don’t want any longer. You can do something differently. 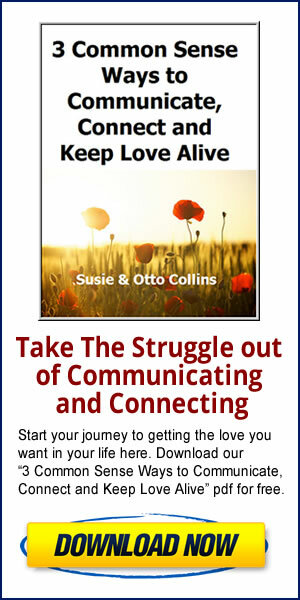 One man told us that by just simply asking the question, “Help me to understand” instead of jumping to the worst possible conclusion, his partner opened up to him in ways that she hadn’t before. He “saw” how his fear that she would leave was “driving his bus” and causing the very thing that he feared would happen. 3. Know that temporary relationship insanity is temporary and will pass. It’s helpful to remember that this is a temporary situation and if you really look at your pattern, you’ll see that given a little space and time, you’ll both come into a better feeling place. We love Bruce Springsteen and often we quote his lyrics to help us through difficult situations. When things look dark, they will change–and usually for the better. Just as Bruce says, there will be some light that will guide you out of the darkness if you allow yourself to see it. You will regain your footing and those damaging thoughts will change–whether it’s thoughts about your partner, your future, or yourself. You will see a new direction or something that you want to do differently. We’ve seen it in our own lives and in the lives of so many others. And it’s true for you as well. When we react from old patterns and fall into the swirl of seemingly never-ending thoughts, it can seem like we or someone else is temporarily insane. But this doesn’t have to last. You can feel love for yourself and for others again. Just allow it to happen.